3 Emissions and Legislation 5. What is Carbon Monoxide (CO)? Carbon monoxide is a compound of carbon and oxygen formed by incomplete combustion in the presence of insufficient air. Diesel engines work with a large surplus of air and therefore normally emit small quantities of carbon monoxide. 6. What is Carbon Dioxide (CO 2 )? Carbon dioxide is one of two natural end products of combustion; the other is water. CO 2 is not toxic and the quantity is directly proportional to the fuel consumption. CO 2 contributes to the climate-impacting so-called greenhouse effect. 7. CO 2 is a global issue. 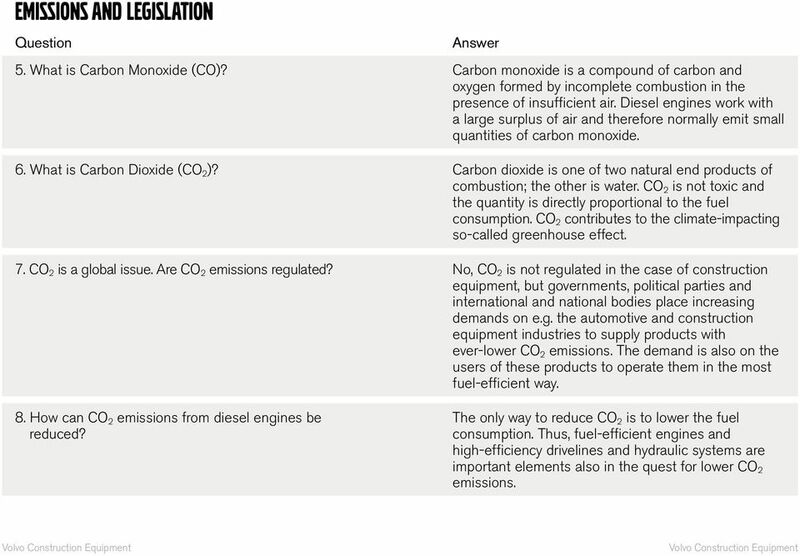 Are CO 2 emissions regulated? No, CO 2 is not regulated in the case of construction equipment, but governments, political parties and international and national bodies place increasing demands on e.g. the automotive and construction equipment industries to supply products with ever-lower CO 2 emissions. The demand is also on the users of these products to operate them in the most fuel-efficient way. 8. How can CO 2 emissions from diesel engines be reduced? The only way to reduce CO 2 is to lower the fuel consumption. Thus, fuel-efficient engines and high-efficiency drivelines and hydraulic systems are important elements also in the quest for lower CO 2 emissions. 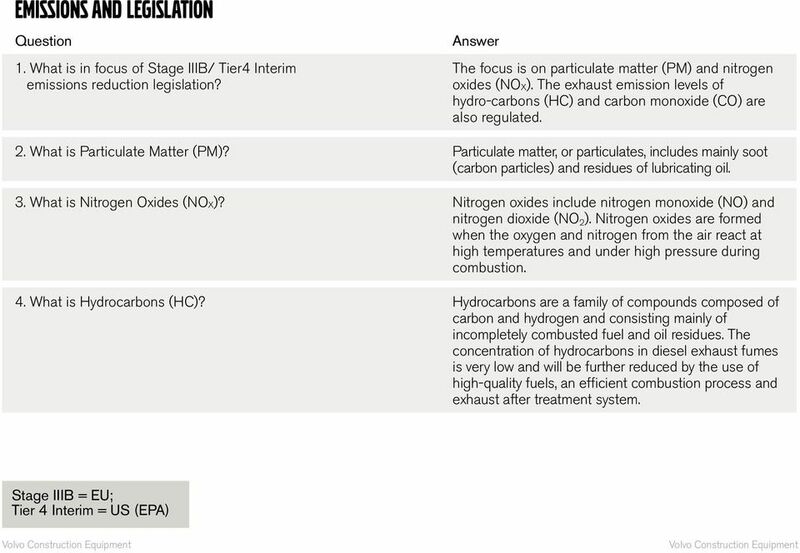 4 Emissions and Legislation 9. How can bio diesel reduce the greenhouse effect? The use of bio-fuels will reduce the green house effect as the production of the bio fuel will absorb some of the CO Has Volvo any particular development programs focusing on the reduction of green house gases? Yes, since fuel has the biggest impact on the green house effect. Volvo is working in many areas such as renewable fuels and hybrid technology. Eco Operator trainings and the all-new Opti-Shift feature are other examples of our fuel-saving initiatives. 11. What is Sulphur Dioxide (SO2)? Sulphur dioxide is formed by combustion of fuels containing sulphur. Sulphur emissions are reduced by the use of low-sulphur ( ppm sulphur content) and ultra-low sulphur fuels (< 15 ppm sulphur content). 12. What is the difference in the regulated emission levels of Stage IIIB/ Tier4 Interim compared to Stage IIIA / Tier 3? 13. When will Stage IIIB and Tier 4 Interim regulations come into effect in the respective geographic areas (N. Am. and EU)? Stage IIIB/ Tier4 Interim calls for a reduction of PM by no less than 90 % and of NO X emission levels by 50 % compared to Stage IIIA / Tier 3 levels. On January 1, See chart. In this regard, the build date of the engine is the crucial factor, i.e. all engines manufactured on and after the respective dates of the new legislation entering into force must comply with the new regulation. 6 Emissions and Legislation 14. Will all new machines available for sale in 2011 and beyond in the market areas concerned be equipped with Stage IIIB/Tier 4 Interim-compliant engines? 15. 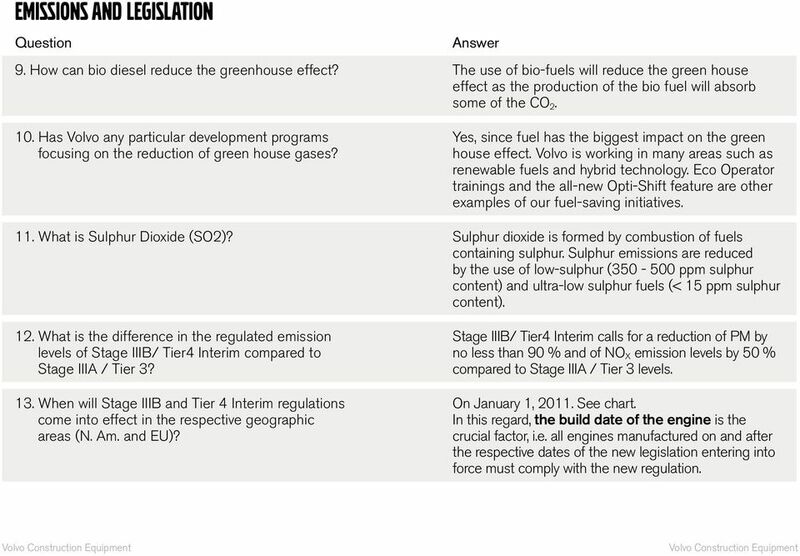 Are the regulated EU Stage IIIB and US (EPA) Tier 4 Interim emission limit values identical? 16. Can I buy an EU certified machine with an EU-compliant engine and export it to the US? No, the regulation contains provisions (transition clauses) that permit a certain degree of flexibility in its enforcement in order to ensure an orderly, rational transition from Stage IIIA/Tier 3 to Stage IIIB/Tier 4 Interim at producer, dealer and end user levels. This will mean that new machines produced prior to 2011, fitted with Stage IIIA/Tier3-compliant engines and still in manufacturer or dealer stocks, can be sold to end users after the year 2010, and that a limited amount of newly produced engines (produced prior to 2011) may be used to equip machines to be manufactured after Also, machine flexibility clauses permit that, upon specific conditions, a limited quantity of Stage IIIA/ Tier3 engines may be built after the year 2010, thus providing the equipment manufacturers another rational option for a smooth transition. Yes, the limit values are in principle the same in both these geographic areas, within the power range in which our equipment operate. No, the EU Stage IIIB-compliant engine receives a certificate only for the area concerned (EU) and is not allowed to enter the US. 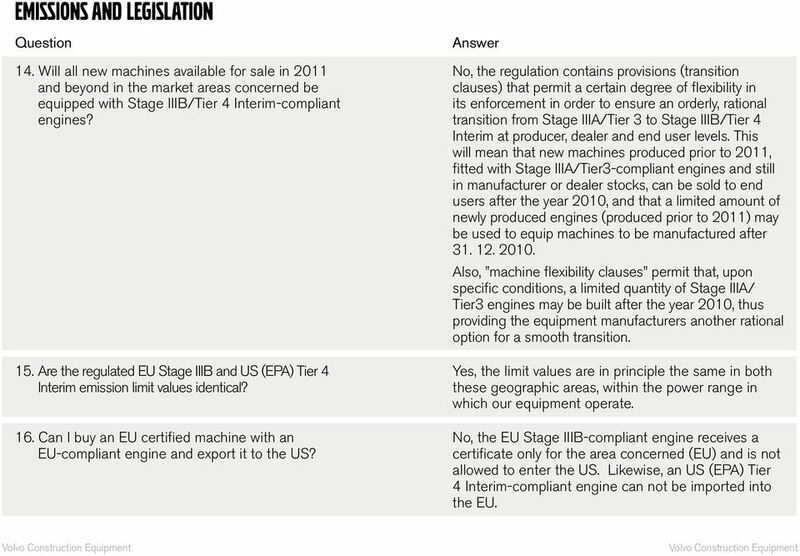 Likewise, an US (EPA) Tier 4 Interim-compliant engine can not be imported into the EU. 7 Emissions and Legislation 17. 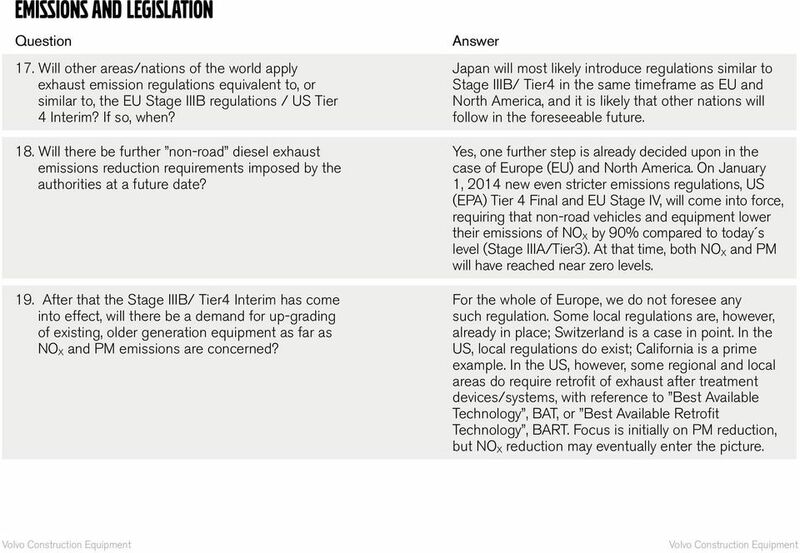 Will other areas/nations of the world apply exhaust emission regulations equivalent to, or similar to, the EU Stage IIIB regulations / US Tier 4 Interim? If so, when? 18. Will there be further non-road diesel exhaust emissions reduction requirements imposed by the authorities at a future date? 19. After that the Stage IIIB/ Tier4 Interim has come into effect, will there be a demand for up-grading of existing, older generation equipment as far as NO X and PM emissions are concerned? Japan will most likely introduce regulations similar to Stage IIIB/ Tier4 in the same timeframe as EU and North America, and it is likely that other nations will follow in the foreseeable future. Yes, one further step is already decided upon in the case of Europe (EU) and North America. 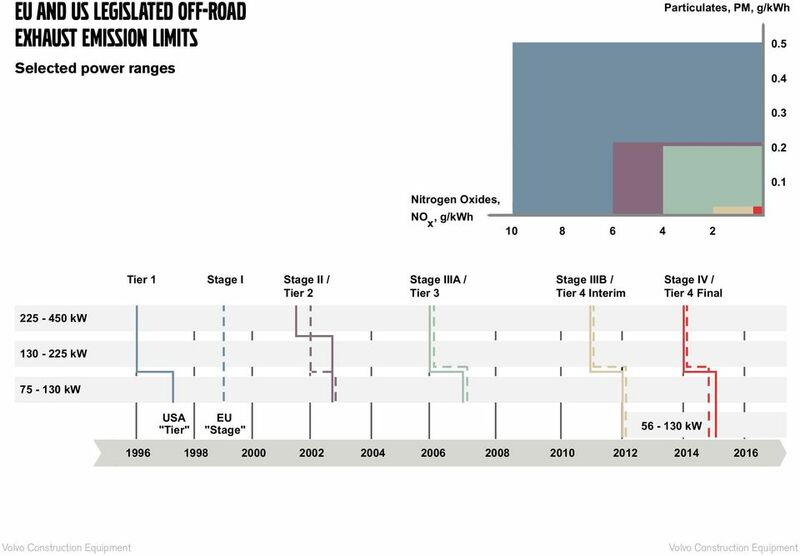 On January 1, 2014 new even stricter emissions regulations, US (EPA) Tier 4 Final and EU Stage IV, will come into force, requiring that non-road vehicles and equipment lower their emissions of NO X by 90% compared to today s level (Stage IIIA/Tier3). At that time, both NO X and PM will have reached near zero levels. For the whole of Europe, we do not foresee any such regulation. Some local regulations are, however, already in place; Switzerland is a case in point. In the US, local regulations do exist; California is a prime example. In the US, however, some regional and local areas do require retrofit of exhaust after treatment devices/systems, with reference to Best Available Technology, BAT, or Best Available Retrofit Technology, BART. Focus is initially on PM reduction, but NO X reduction may eventually enter the picture. 8 Emissions Reduction Technology, general 20. What technology options are available in order to achieve the demanding Tier 4 Interim/Stage IIIB emission limits? NO X and PM reduction can be achieved in several ways, each one having its merits and, unfortunately, also its drawbacks. For example, in-engine NO X reduction generally leads to higher PM emission levels, and the opposite, in-engine reduction of PM leads to high NO X emissions. Optimization of fuel injection- and air handling management, including different EGR (Exhaust Gas Recirculation) configurations (cooled/ non-cooled etc. ), and various exhaust after treatment technologies, including Diesel Particulate Filters and the NO X -reducing SCR (Selective Catalytic Reduction) technology are all part of Volvos emissions reduction tool-box. Third-generation Volvo EMS-2 (Engine Management System) enhanced electronic controller, featuring a more powerful processor, makes the tool-box complete. 9 Emissions Reduction Technology, general 21. Could you briefly describe the two diesels exhaust after-treatment technologies mentioned DPF and SCR? Diesel Particulate Filter, DPF, is a device in which the particulates are collected and then oxidized by passive or active regeneration. Advanced electronic control of the process is a necessity to ensure effective PM removal in any and all engine duty cycles. In addition, the base engine has to be fine-tuned for minimized engine-out NO X emissions to meet the required legislated NO X level. Selective Catalytic Reduction, SCR, is a technology where a reagent, is injected into the exhaust gas flow and mixed in a catalytic converter which reduces the NO X to harmless Nitrogen and Oxygen. The reagent is a mixture of 32,5% urea and 67,5% water and is in Europe commercially called AdBlue and in the US, DEF (Diesel Engine Fluid). Depending on engine load factor, the urea usage corresponds to approx. 5% of the diesel usage. The base engine has, in any event, to be fine-tuned for a minimum of engine-out PM emissions as required by the Stage IIIB/Tier 4 Interim emission regulations. Ultra-low sulphur fuels and low-ash lubricating oils will be a must for these technologies to function properly. 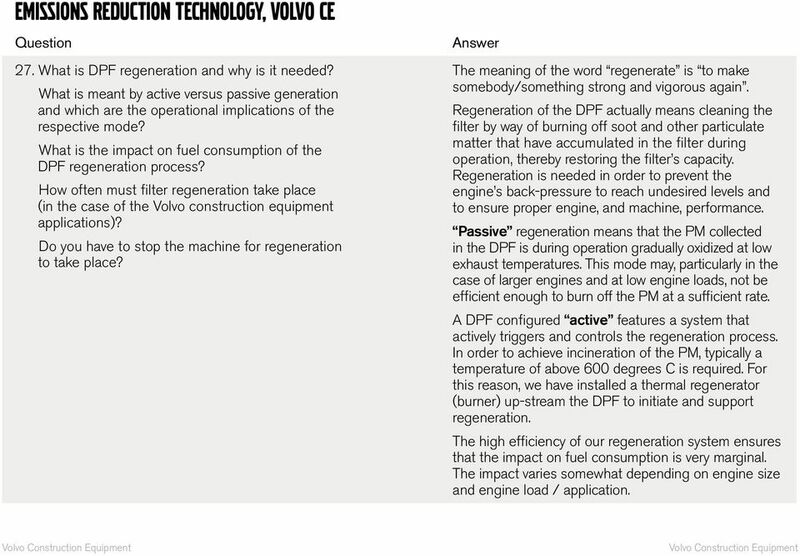 10 Emissions Reduction Technology, Volvo CE 22. 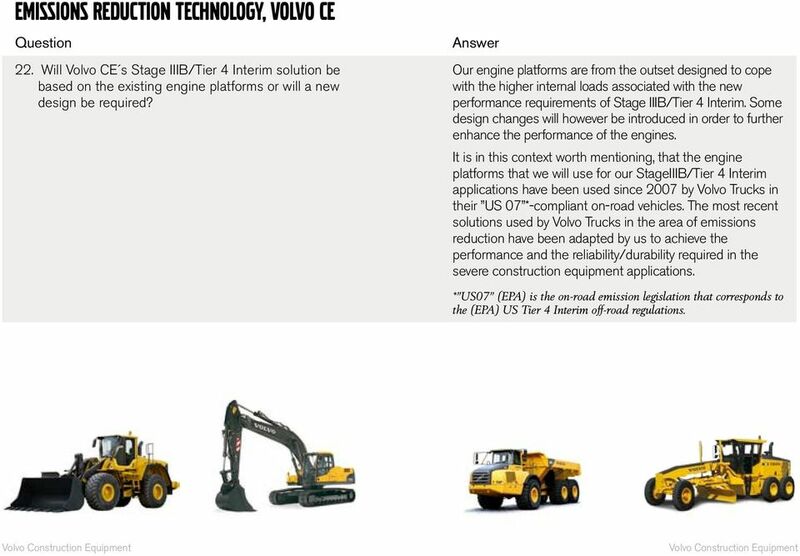 Will Volvo CE s Stage IIIB/Tier 4 Interim solution be based on the existing engine platforms or will a new design be required? Our engine platforms are from the outset designed to cope with the higher internal loads associated with the new performance requirements of Stage IIIB/Tier 4 Interim. Some design changes will however be introduced in order to further enhance the performance of the engines. It is in this context worth mentioning, that the engine platforms that we will use for our StageIIIB/Tier 4 Interim applications have been used since 2007 by Volvo Trucks in their US 07 *-compliant on-road vehicles. The most recent solutions used by Volvo Trucks in the area of emissions reduction have been adapted by us to achieve the performance and the reliability/durability required in the severe construction equipment applications. * US07 (EPA) is the on-road emission legislation that corresponds to the (EPA) US Tier 4 Interim off-road regulations. 11 Emissions Reduction Technology, Volvo CE 23. 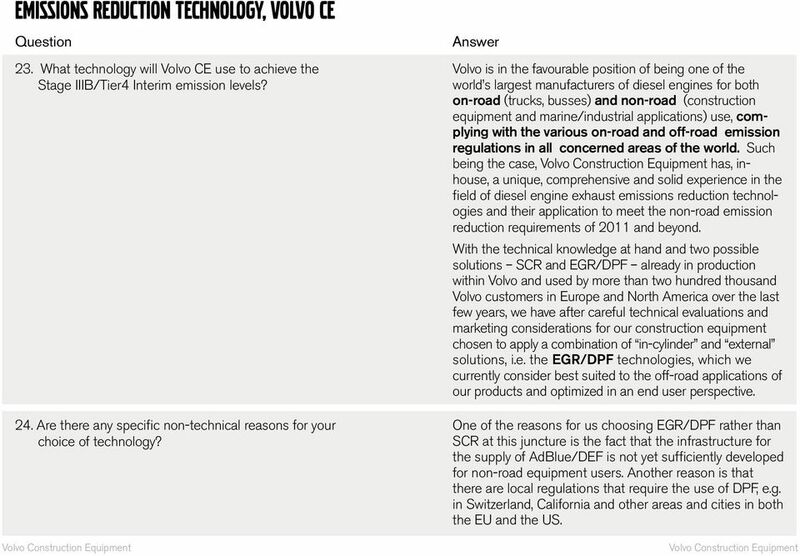 What technology will Volvo CE use to achieve the Stage IIIB/Tier4 Interim emission levels? 24. Are there any specific non-technical reasons for your choice of technology? Volvo is in the favourable position of being one of the world s largest manufacturers of diesel engines for both on-road (trucks, busses) and non-road (construction equipment and marine/industrial applications) use, complying with the various on-road and off-road emission regulations in all concerned areas of the world. Such being the case, has, inhouse, a unique, comprehensive and solid experience in the field of diesel engine exhaust emissions reduction technologies and their application to meet the non-road emission reduction requirements of 2011 and beyond. 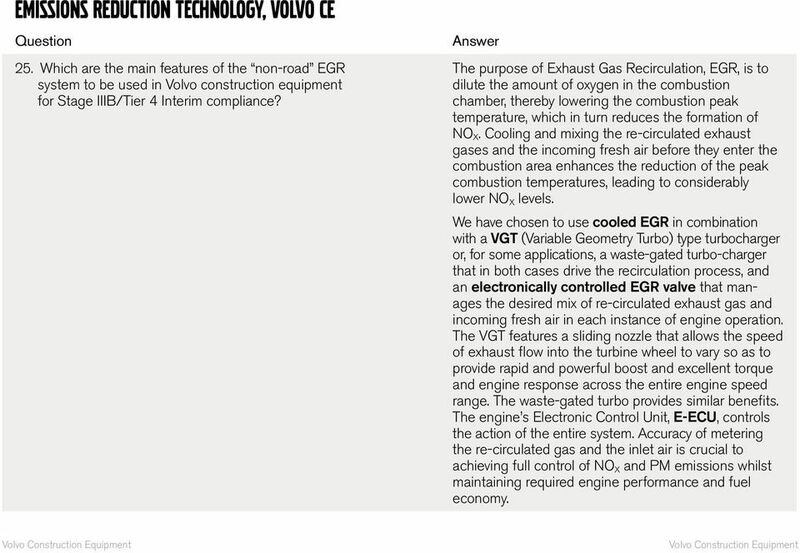 With the technical knowledge at hand and two possible solutions SCR and EGR/DPF already in production within Volvo and used by more than two hundred thousand Volvo customers in Europe and North America over the last few years, we have after careful technical evaluations and marketing considerations for our construction equipment chosen to apply a combination of in-cylinder and external solutions, i.e. the EGR/DPF technologies, which we currently consider best suited to the off-road applications of our products and optimized in an end user perspective. One of the reasons for us choosing EGR/DPF rather than SCR at this juncture is the fact that the infrastructure for the supply of AdBlue/DEF is not yet sufficiently developed for non-road equipment users. Another reason is that there are local regulations that require the use of DPF, e.g. in Switzerland, California and other areas and cities in both the EU and the US. 12 Emissions Reduction Technology, Volvo CE 25. Which are the main features of the non-road EGR system to be used in Volvo construction equipment for Stage IIIB/Tier 4 Interim compliance? The purpose of Exhaust Gas Recirculation, EGR, is to dilute the amount of oxygen in the combustion chamber, thereby lowering the combustion peak temperature, which in turn reduces the formation of NO X. Cooling and mixing the re-circulated exhaust gases and the incoming fresh air before they enter the combustion area enhances the reduction of the peak combustion temperatures, leading to considerably lower NO X levels. We have chosen to use cooled EGR in combination with a VGT (Variable Geometry Turbo) type turbocharger or, for some applications, a waste-gated turbo-charger that in both cases drive the recirculation process, and an electronically controlled EGR valve that manages the desired mix of re-circulated exhaust gas and incoming fresh air in each instance of engine operation. The VGT features a sliding nozzle that allows the speed of exhaust flow into the turbine wheel to vary so as to provide rapid and powerful boost and excellent torque and engine response across the entire engine speed range. The waste-gated turbo provides similar benefits. The engine s Electronic Control Unit, E-ECU, controls the action of the entire system. Accuracy of metering the re-circulated gas and the inlet air is crucial to achieving full control of NO X and PM emissions whilst maintaining required engine performance and fuel economy. 13 Emissions Reduction Technology, Volvo CE 26. 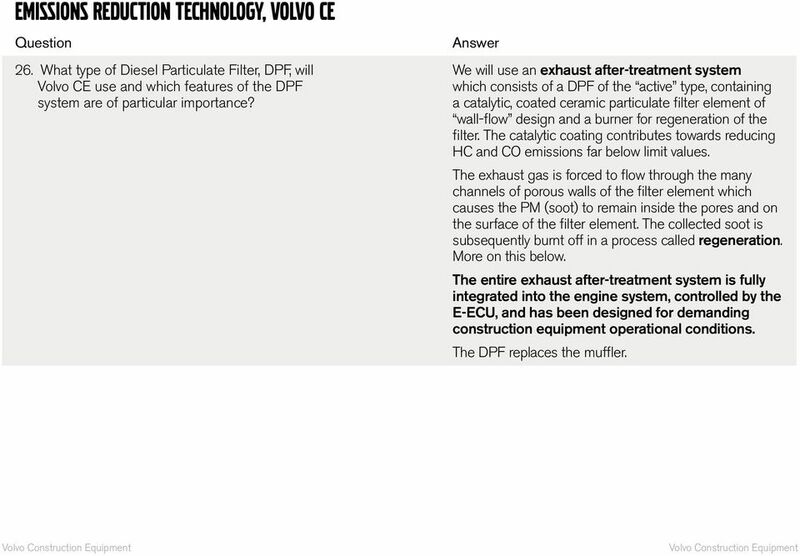 What type of Diesel Particulate Filter, DPF, will Volvo CE use and which features of the DPF system are of particular importance? We will use an exhaust after-treatment system which consists of a DPF of the active type, containing a catalytic, coated ceramic particulate filter element of wall-flow design and a burner for regeneration of the filter. The catalytic coating contributes towards reducing HC and CO emissions far below limit values. The exhaust gas is forced to flow through the many channels of porous walls of the filter element which causes the PM (soot) to remain inside the pores and on the surface of the filter element. The collected soot is subsequently burnt off in a process called regeneration. More on this below. The entire exhaust after-treatment system is fully integrated into the engine system, controlled by the E-ECU, and has been designed for demanding construction equipment operational conditions. The DPF replaces the muffler. 14 Emissions Reduction Technology, Volvo CE 27. What is DPF regeneration and why is it needed? What is meant by active versus passive generation and which are the operational implications of the respective mode? What is the impact on fuel consumption of the DPF regeneration process? 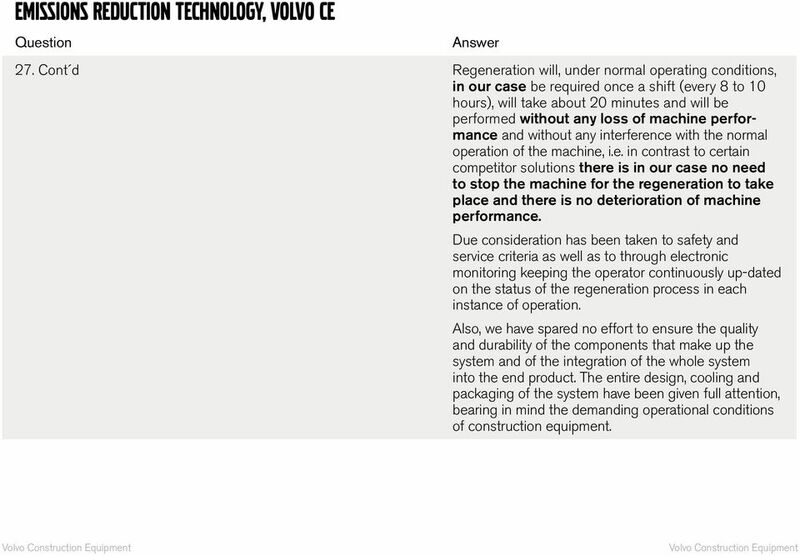 How often must filter regeneration take place (in the case of the Volvo construction equipment applications)? Do you have to stop the machine for regeneration to take place? The meaning of the word regenerate is to make somebody/something strong and vigorous again. Regeneration of the DPF actually means cleaning the filter by way of burning off soot and other particulate matter that have accumulated in the filter during operation, thereby restoring the filter s capacity. Regeneration is needed in order to prevent the engine s back-pressure to reach undesired levels and to ensure proper engine, and machine, performance. Passive regeneration means that the PM collected in the DPF is during operation gradually oxidized at low exhaust temperatures. This mode may, particularly in the case of larger engines and at low engine loads, not be efficient enough to burn off the PM at a sufficient rate. A DPF configured active features a system that actively triggers and controls the regeneration process. In order to achieve incineration of the PM, typically a temperature of above 600 degrees C is required. For this reason, we have installed a thermal regenerator (burner) up-stream the DPF to initiate and support regeneration. The high efficiency of our regeneration system ensures that the impact on fuel consumption is very marginal. The impact varies somewhat depending on engine size and engine load / application. 15 Emissions Reduction Technology, Volvo CE 27. Cont d Regeneration will, under normal operating conditions, in our case be required once a shift (every 8 to 10 hours), will take about 20 minutes and will be performed without any loss of machine performance and without any interference with the normal operation of the machine, i.e. in contrast to certain competitor solutions there is in our case no need to stop the machine for the regeneration to take place and there is no deterioration of machine performance. Due consideration has been taken to safety and service criteria as well as to through electronic monitoring keeping the operator continuously up-dated on the status of the regeneration process in each instance of operation. Also, we have spared no effort to ensure the quality and durability of the components that make up the system and of the integration of the whole system into the end product. The entire design, cooling and packaging of the system have been given full attention, bearing in mind the demanding operational conditions of construction equipment. 16 Emissions Reduction Technology, Volvo CE 28. 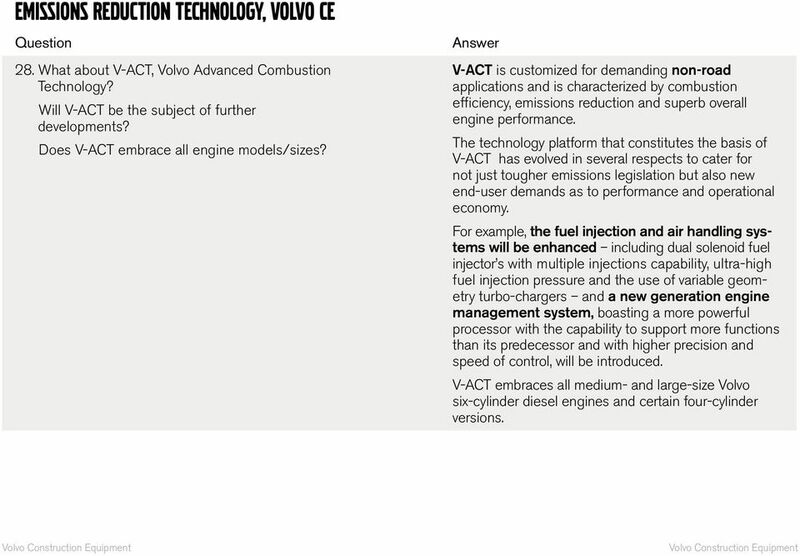 What about V-ACT, Volvo Advanced Combustion Technology? Will V-ACT be the subject of further developments? Does V-ACT embrace all engine models/sizes? V-ACT is customized for demanding non-road applications and is characterized by combustion efficiency, emissions reduction and superb overall engine performance. The technology platform that constitutes the basis of V-ACT has evolved in several respects to cater for not just tougher emissions legislation but also new end-user demands as to performance and operational economy. For example, the fuel injection and air handling systems will be enhanced including dual solenoid fuel injector s with multiple injections capability, ultra-high fuel injection pressure and the use of variable geometry turbo-chargers and a new generation engine management system, boasting a more powerful processor with the capability to support more functions than its predecessor and with higher precision and speed of control, will be introduced. V-ACT embraces all medium- and large-size Volvo six-cylinder diesel engines and certain four-cylinder versions. 17 Emissions Reduction Technology, Volvo CE 29. 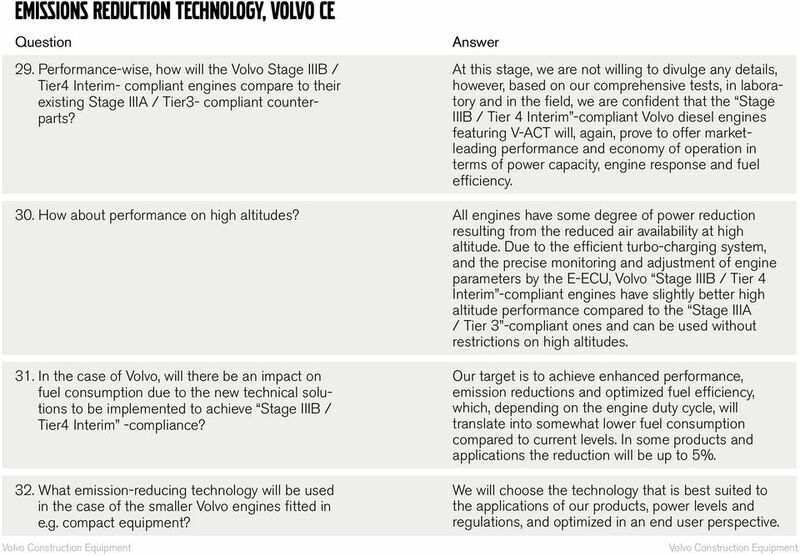 Performance-wise, how will the Volvo Stage IIIB / Tier4 Interim- compliant engines compare to their existing Stage IIIA / Tier3- compliant counterparts? At this stage, we are not willing to divulge any details, however, based on our comprehensive tests, in laboratory and in the field, we are confident that the Stage IIIB / Tier 4 Interim -compliant Volvo diesel engines featuring V-ACT will, again, prove to offer marketleading performance and economy of operation in terms of power capacity, engine response and fuel efficiency. 30. How about performance on high altitudes? All engines have some degree of power reduction resulting from the reduced air availability at high altitude. Due to the efficient turbo-charging system, and the precise monitoring and adjustment of engine parameters by the E-ECU, Volvo Stage IIIB / Tier 4 Interim -compliant engines have slightly better high altitude performance compared to the Stage IIIA / Tier 3 -compliant ones and can be used without restrictions on high altitudes. 31. In the case of Volvo, will there be an impact on fuel consumption due to the new technical solutions to be implemented to achieve Stage IIIB / Tier4 Interim -compliance? 32. What emission-reducing technology will be used in the case of the smaller Volvo engines fitted in e.g. compact equipment? Our target is to achieve enhanced performance, emission reductions and optimized fuel efficiency, which, depending on the engine duty cycle, will translate into somewhat lower fuel consumption compared to current levels. In some products and applications the reduction will be up to 5%. We will choose the technology that is best suited to the applications of our products, power levels and regulations, and optimized in an end user perspective. 18 Emissions Reduction Technology, Volvo CE 33. 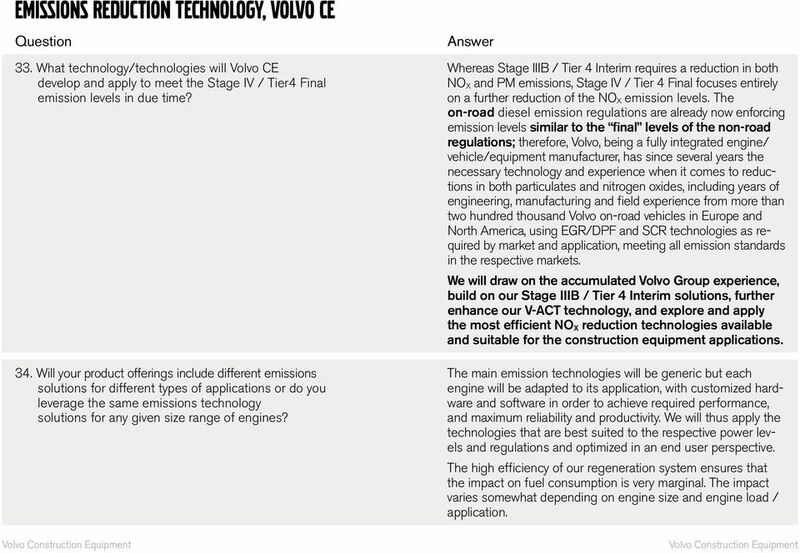 What technology/technologies will Volvo CE develop and apply to meet the Stage IV / Tier4 Final emission levels in due time? 34. Will your product offerings include different emissions solutions for different types of applications or do you leverage the same emissions technology solutions for any given size range of engines? 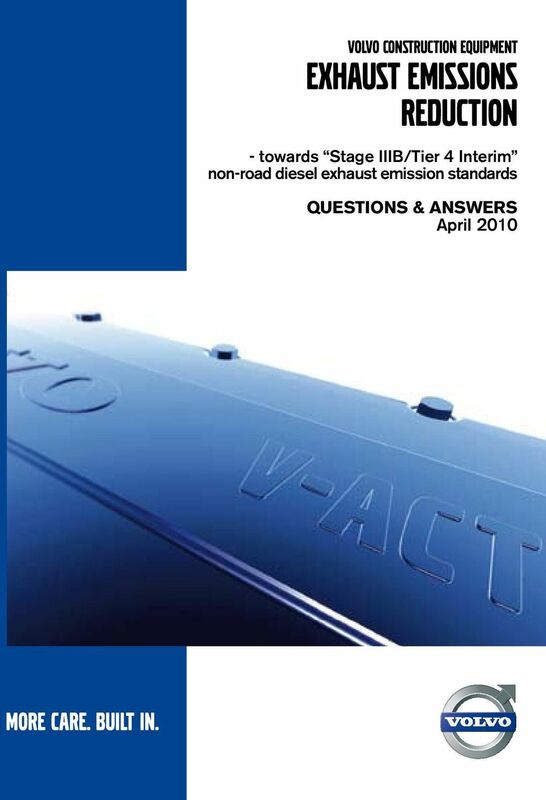 Whereas Stage IIIB / Tier 4 Interim requires a reduction in both NO X and PM emissions, Stage IV / Tier 4 Final focuses entirely on a further reduction of the NO X emission levels. 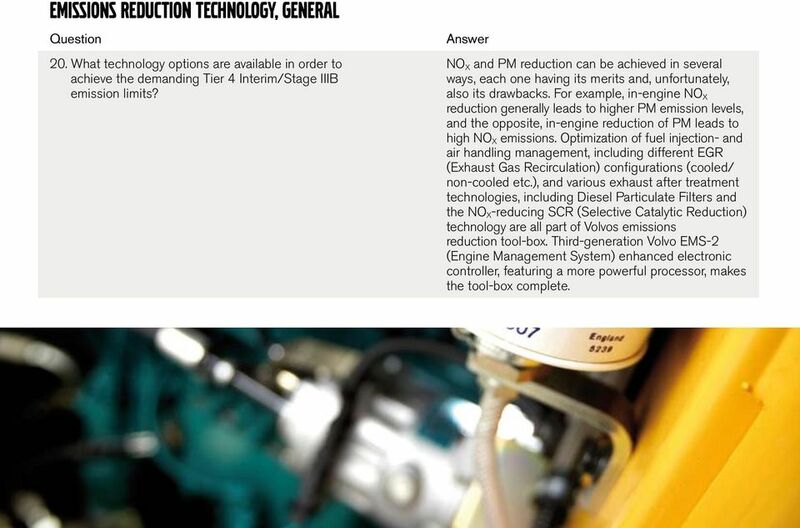 The on-road diesel emission regulations are already now enforcing emission levels similar to the final levels of the non-road regulations; therefore, Volvo, being a fully integrated engine/ vehicle/equipment manufacturer, has since several years the necessary technology and experience when it comes to reductions in both particulates and nitrogen oxides, including years of engineering, manufacturing and field experience from more than two hundred thousand Volvo on-road vehicles in Europe and North America, using EGR/DPF and SCR technologies as required by market and application, meeting all emission standards in the respective markets. We will draw on the accumulated Volvo Group experience, build on our Stage IIIB / Tier 4 Interim solutions, further enhance our V-ACT technology, and explore and apply the most efficient NO X reduction technologies available and suitable for the construction equipment applications. The main emission technologies will be generic but each engine will be adapted to its application, with customized hardware and software in order to achieve required performance, and maximum reliability and productivity. We will thus apply the technologies that are best suited to the respective power levels and regulations and optimized in an end user perspective. The high efficiency of our regeneration system ensures that the impact on fuel consumption is very marginal. The impact varies somewhat depending on engine size and engine load / application. 19 Volvo CE vs. Volvo Penta 35. Volvo Penta, a sister company of Volvo CE, is a supplier of diesel engines to, amongst other, the construction and industrial equipment sectors. What exactly is the role of Volvo Penta in this context? 36. What type of applications does Volvo Penta address? 37. Why has Volvo Penta chosen SCR (and Volvo CE EGR/DPF ) for Stage IIIB / Tier 4 Interim compliance? 38. 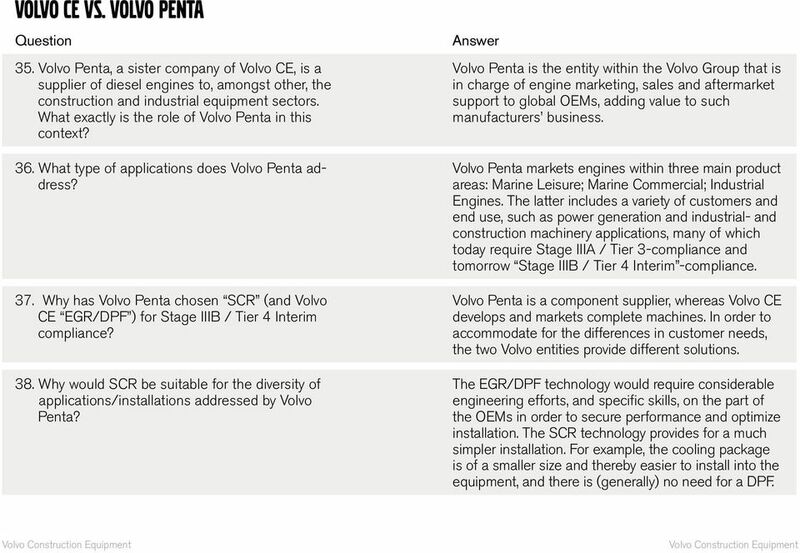 Why would SCR be suitable for the diversity of applications/installations addressed by Volvo Penta? Volvo Penta is the entity within the Volvo Group that is in charge of engine marketing, sales and aftermarket support to global OEMs, adding value to such manufacturers business. Volvo Penta markets engines within three main product areas: Marine Leisure; Marine Commercial; Industrial Engines. The latter includes a variety of customers and end use, such as power generation and industrial- and construction machinery applications, many of which today require Stage IIIA / Tier 3-compliance and tomorrow Stage IIIB / Tier 4 Interim -compliance. Volvo Penta is a component supplier, whereas Volvo CE develops and markets complete machines. In order to accommodate for the differences in customer needs, the two Volvo entities provide different solutions. The EGR/DPF technology would require considerable engineering efforts, and specific skills, on the part of the OEMs in order to secure performance and optimize installation. The SCR technology provides for a much simpler installation. For example, the cooling package is of a smaller size and thereby easier to install into the equipment, and there is (generally) no need for a DPF. 20 Volvo CE vs. Volvo Trucks 39. 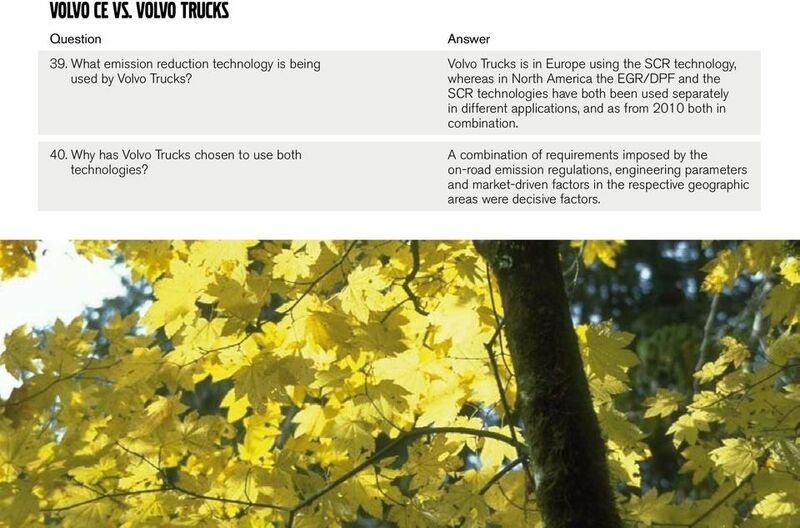 What emission reduction technology is being used by Volvo Trucks? 40. Why has Volvo Trucks chosen to use both technologies? Volvo Trucks is in Europe using the SCR technology, whereas in North America the EGR/DPF and the SCR technologies have both been used separately in different applications, and as from 2010 both in combination. A combination of requirements imposed by the on-road emission regulations, engineering parameters and market-driven factors in the respective geographic areas were decisive factors. 21 Service & Maintenance 41. What about service intervals and serviceability and maintenance in the case of StageIIIB / Tier4 Interim -compliant Volvo construction equipment? The service intervals will, by and large, remain the same as for current generation of equipment. There will inevitably be some differences as to serviceability and some minor differences as to maintenance, e.g. in the area of the DPF. 42. 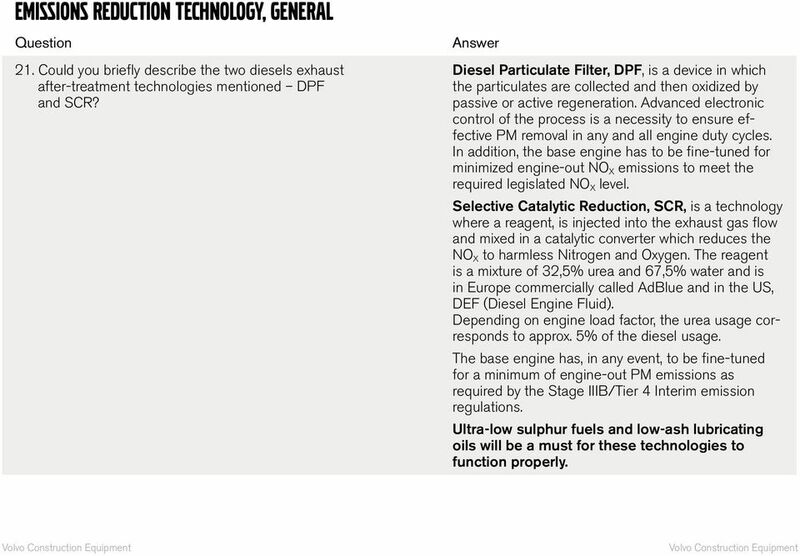 What is the service interval of the DPF? The service interval will be 4500 hours (for engines 130 kw/174 hp and greater). 43. How do I service the DPF? There will be a Volvo Reman service exchange program covering the DPF; this will be the only solution provided by Volvo. This is the most cost- and time effective solution, keeping uptime to a maximum. 44. How does the Reman service exchange program work as to the cleaning of the DPF? Do I get a warranty? 45. Can I service the DPF myself without voiding the warranty? Prior to the filter cleaning process, the filter will be checked for defects in a test bench. Any filter having damages or any other sign of defect will be rejected and replaced with a new filter. In addition, the filter will be backed with a full Volvo warranty. No, it is not allowed to do any service to the DPF during the warranty time. Under normal conditions, the DPF does not need any service during the warranty time. 46. Will Volvo offer any cleaning service kit? No, all will be taken care of by means of Volvo Reman service exchange kit. 22 Service & Maintenance 47. How long is the machine down for a DPF change? 48. Will the dealer have the service exchange filters in stock? The change of DPF to a Volvo Reman service exchange DPF filter takes approx. 1 hour. Our extensive dealer network will store the processed filters, in order to keep uptime to a maximum. 49. Can I run without the DPF filter for a while? No, You are not allowed to run the machine without a functioning DPF. 50. Is there a limp home strategy if the regeneration system fails or if the filter plugs? Yes, there is a limp home strategy, should the regeneration system fail or the filter plug. 23 Miscellaneous 51. The use of ultra-low sulphur fuel will be a necessity in conjunction to the technologies available for Stage IIIB / Tier 4 Interim. What about the availability of this fuel in Europe? 52. Are you aware of competitors technologies for Stage IIIB / Tier 4 Interim? How do you rank Volvo s technologies vs. those of the competitors? 53. Can a Tier IIIA/Tier 3 -compliant engine be updated to meet Stage IIIB/Tier 4 Interim emissions regulations? 54. Has Volvo any solution to offer customers who, for one reason or other, would need to retrofit an exhaust after treatment device/system? 55. Will there be any cost implications due to the application of new technology associated with Stage IIIB / Tier 4 Interim emissions requirements? The petroleum industry has, by legislation, the obligation to ensure that such fuel is available also for non-road use in the EU countries by January 1, Some EU countries, such as Germany and Sweden already now have full availability of ultra-low sulphur fuel. We are confident that our technologies, and the way that they will be applied in our products, will prove to be very competitive. We believe that customer requirements such as uptime, operational convenience and full, uninterrupted performance under all conditions will be very satisfactorily met with our solutions. No. The cost impact would far outweigh the benefit. Also, a separate certification of that specific engine would be required. For retrofits, we have partnered with the German company HUSS for them to provide their MK particulate filtration system that offers a 99% particulate matter (PM) reduction for Stage I / Tier 1 through Stage IIIA / Tier 3 engines. Yes, all manufacturers will have to apply new, additional technology that will, inevitably, add some cost to the end product. 24 Miscellaneous 56. Will Volvo develop and supply specific future engine variants for markets not necessitating the advanced technology associated with Stage IIIB / Tier 4 Interim requirements? 57. Is the ash removed from the particulate filter hazardous? 58. Do I need to change my fuel supply in view of Stage IIIB / Tier 4 Interim -compliant equipment? 59. What happens if by mistake diesel with high sulphur level is used instead of ultra-low sulphur diesel? 60. Can I use biodiesel in Stage IIIB / Tier 4 Interim - compliant Volvo engines/equipment? To markets where ultra-low sulphur fuel will not be available, we will supply sulphur-tolerant engine versions. Generally not; the ash, however, contains a tiny amount of metal particles. As explained earlier on in this booklet, the use of ultra-low sulphur diesel (ULSD) fuel will be a necessity. High sulphur levels are incompatible with the exhaust aftertreatment technology that will be used for Stage IIIB / Tier 4 Interim- compliance. ULSD furthermore contributes towards less PM and considerably less sulphur dioxide (SO 2 ) emissions. The higher level of sulphur will jeopardize the catalytic function of the DPF and cause malfunction of the regeneration system. Extensive use of high level sulphur may also cause corrosion of internal engine parts. 7 % biodiesel can be used generally; higher bio-fuel rates to be approved on a case by case basis. 25 Miscellaneous 61. Do I have to run special oil? Will Volvo have suitable oil on offer? Can I use such oil in my older Volvo machines? 62. What about exhausts from the crankcase ventilation system? 63. How and how much have you tested the new engines systems associated with Stage IIIB / Tier 4 Interim compliance? 64. What about the life expectancy of a Volvo Stage IIIB / Tier 4 Interim engine? Improved? Stable? Reduced? Yes, new higher-grade oils will be required for the new technology to function properly. We will through our dealer network provide the recommended oil, Volvo Ultra Diesel Engine Oil, VDS-4. This oil will be backwards compatible, provided the fuel sulphur level is less than 500 ppm. A centrifugal-type crankcase ventilation system is used to filter and recycle the oil mist in the crankcase gases. No periodic maintenance is required. Solid RG (Reliability Growth) programs including validations of performance, quality and durability of components, subsystems, engine and machine systems have been in place since the start several years ago of the development of the new generation of Stage IIIB/Tier 4 Interim- compliant equipment. Field testing programs covering all relevant machine models across the product range have been and are running in parallel with all other testing and validation activities. The service life is expected to be the same as the one of earlier generations of Volvo engines. 26 Miscellaneous 65. What will be your pricing strategy for the Stage IIIB / Tier 4 Interim -compliant equipment? 66. How will Total Cost of Ownership (TCO) of my Stage IIIB / Tier 4 Interim -compliant equipment be impacted? 67. When will you show Stage IIIB / Tier 4 Interim - compliant machines? When will they be launched in the respective markets? 68. Are you planning some specific actions to prepare the introduction of these new machines in the markets concerned? There are of course unavoidable price increases associated with the introduction of the expensive new Stage IIIB/Tier 4 Interim -compliant technology into the equipment. As always, market developments including competition and customer reactions will be important factors to consider as we formulate our pricing strategy for 2011 and beyond. The TCO will most certainly be affected due to various factors such as higher equipment purchase price, lower fuel consumption, higher productivity and other parameters depending on application and site conditions. The first show of the new machines in the relevant power brackets will occur as of Full launch of the respective new machine models in the various markets will follow in due course in 2011 and beyond as per specific launch plans for each market. Yes, there will be ample information available and training given to our staff, to our dealers and, to the extent necessary, to customers/end users, particularly in the areas of operation, maintenance and service. T By-Pass Filters: Taking Your Fleet the Extra Mile Donald S. Culpepper Gulf Coast Filters, Inc. here has been an industry-wide push over the last few years to extend oil drain intervals on fleet equipment. Proceedings of DEER 2003: Diesel Engine Emissions Reduction Newport, Rhode Island, August 2003 STATE OF THE ART AND FUTURE DEVELOPMENTS IN NATURAL GAS ENGINE TECHNOLOGIES Mark Dunn, Cummins Westport Inc. COMBUSTION. By: Michael Biarnes. In collaboration with: Bill Freed and Jason Esteves. E Instruments International LLC - www.e-inst.